In the quest for abundant, inexhaustible energy one should very seriously consider advanced forms of Nuclear energy, particularly, MSRs (Molten Salt Reactors.) Nuclear energy has one very significant advantage over all forms of fossil fuels, as well as renewables. It has an enormous energy density. Consider Fossil fuels. Let us look at Methane, (CH4) as a simple representative fossil fuel. Upon burning Methane, approximately 9 electron Volts (eV) of energy is released per molecule of methane. All fossil fuels are in this ballpark of energy per (carbon) atom of fuel. Now consider any fissile (nuclear) material. This could be Uranium-235, Uranium-233 or Plutonium-239. Upon fission of these materials, approximately 200,000,000 electron Volts (eV) of energy is release per atom of fissile material. Two Hundred MILLION. All fissile fuels are in this ballpark of energy per atom of fuel. This difference is enormous. To be fair, the mass of an atom of fissile material is much heavier than a molecule of fossil fuel. But even after normalizing for mass, the energy density (energy per unit mass) of any fissile fuel is over 1,000,000 times greater than the energy density of any fossil fuel! The ramifications cannot be overstated. 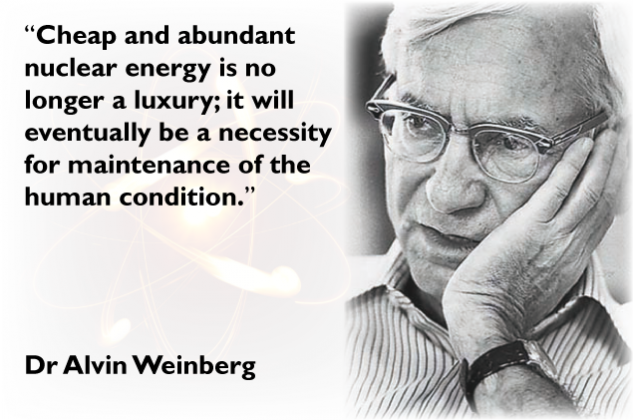 If the goal is to have energy in abundance, and have it for millennia, nuclear energy deserves a serious look. For this purpose, nuclear is the only game in town. Present day nuclear power plants consume (or “burn”) an isotope of uranium, U-235. Only 0.7% of natural uranium is U-235. The other 99.3% of uranium is U-238. U-238 can be converted to plutonium-239 in a process called breeding. Plutonium-239 can then “burned” as fuel. There have been significant efforts over the past 60 years to build reactors that breed and burn Pu-239, but these have met with limited commercial success. However, there exists another element that can be bred into a consumable fuel. That element is Thorium. Thorium can be bred into Uranium-233. U-233 is fissile, and thus is consumable as a nuclear fuel. In the 1950s and 60s there was a significant effort to develop reactors to consume and breed U-233 from Thorium. This was done at Oak Ridge National Labs under the direction of the lab’s director, Alvin Weinberg (http://en.wikipedia.org/wiki/Alvin_M._Weinberg). Interestingly, Alvin Weinberg is listed as one of the inventors on the patent of the light water reactor (LWR), the predominant type of nuclear power reactor used in the world today. LWRs are based on the consumption of U-235. At the dawn of the nuclear era, nearly all nuclear scientists and engineers, Including Alvin Weinberg, considered nuclear power based on the consumption of U-235 as a “stop gap” measure. The real promise of nuclear power was to be had with breeder reactors. Here, arguably, history took a wrong turn. Two methods of breeding nuclear fuel exist. Method 1: The breeding of Pu-239 from U-238. This allows the use of all of the uranium mined as fuel, not just the 0.7% of it that is U-235. This method was pursued with significant effort, but with little commercial success to date. 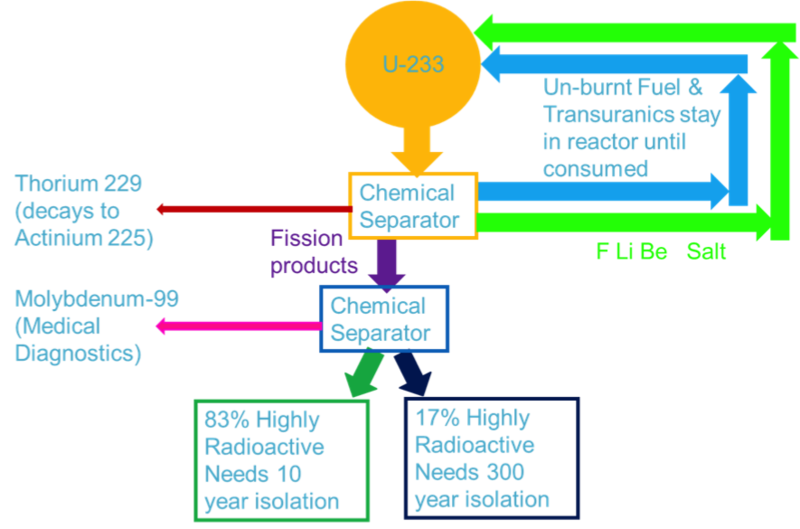 Method 2: The breeding of U-233 from Thorium-232. This method was not pursued to the degree it merited. The reasons Method 1 was more vigorously pursued over Method 2 were partially technical, but mostly political. However, despite receiving only a tiny fraction of the funding of Method 1, the work done at Oak Ridge demonstrated the feasibility of breeding U-233 from Thorium, as well as burning U-233 dissolved in Molten Salts. These molten salts serve as a carrier fluid for both Thorium and Uranium. The resulting design has been coined the Liquid Fluoride Thorium Reactor or LFTR. Thorium has some unique characteristics that make it well suited for use in a molten salt breeder reactor. Natural Thorium is 100% Th-232. Although it is not fissile, it is fertile. That is, Thorium-232 can absorb a neutron and will undergo two beta-decay reactions to become Uranium-233. Uranium-233 is fissile. A Uranium-233 atom can absorb a neutron and then fission to yield about 200 Million eV (200 MeV) of energy and about 2.5 neutrons (on average). 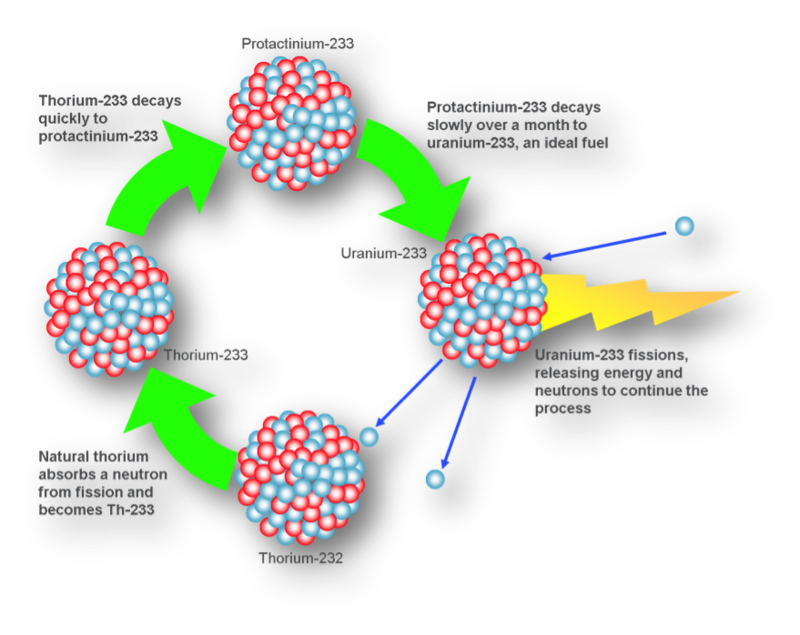 These neutrons can be used to continue the “burning” (fission) of Uranium-233 as well as the conversion of Thorium-232 to Uranium-233 to keep the process going. 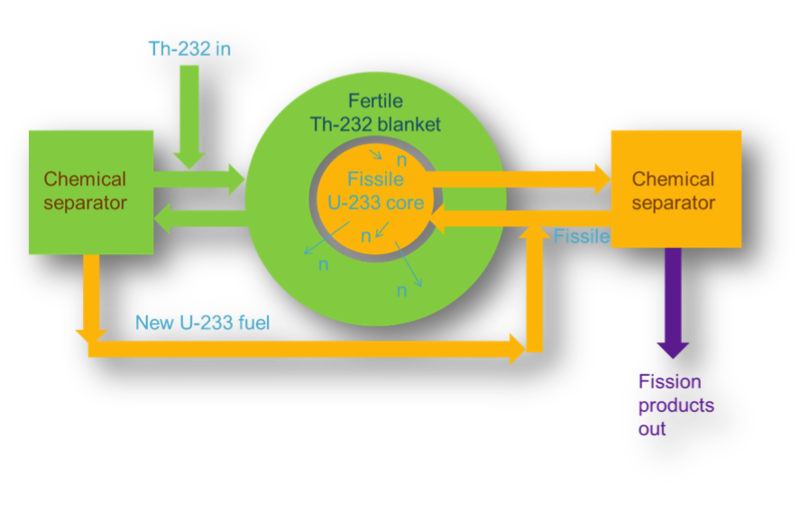 In this way, as fuel (U-233) is consumed, it is replaced by the conversion of Thorium-232 to Uranium-233. Once the process is started, it can continue indefinitely (as long as the Thorium is replaced as it is consumed). To maintain the breeding-burning reaction indefinitely, a number of issues need to be considered. The average number of neutrons released per fission. The probability that upon neutron absorption a fissile atom will actually fission. And the probability of neutron loss (by un-wanted absorption or leaking) in a reactor design. Interestingly, only Thorium can achieve this indefinite Thorium–Uranium breeding–burning in a Thermal neutron spectrum. When neutrons are released via fission they are moving extremely fast. 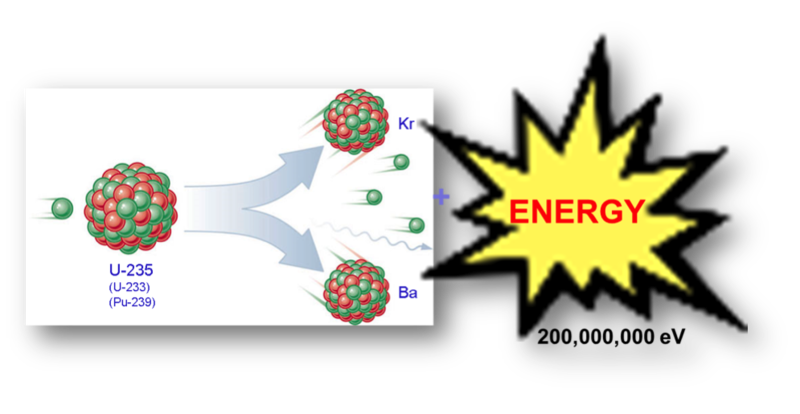 Each neutron has a kinetic energy in the range of 1 million electron Volts (1 MeV). These high energy neutrons slow down via collisions until their kinetic energy is similar to the kinetic energy of the surrounding material. This energy is as per thermal motion and is on the order of 0.1 eV. Neutrons that are slowed down to these (<0.1 eV) energies are said to be thermalized. Slowing down (or moderating) the neutrons is a significant aspect of many reactor designs. It turns out that Neutrons are much more readily absorbed by fissile material (U-233, U-235 or Pu-239) as well as fertile material (Th-232 or U-238) at thermal energies. This has significant ramifications for the reactor design. Reactors that operate with thermal neutrons are typically smaller (have higher power densities) and safer (fuel re-criticality is largely eliminated) then reactors that operate with “fast” neutrons (reactor designs that utilize the neutrons at the high kinetic energies at which they are released). When fission occurs, the nuclei split into two pieces. These pieces are the fission products. The number of protons per piece determines the atomic number, and thus the element that each piece is. The atomic number of each fission product is not always the same. In fact a whole range of elements are produced by fission. 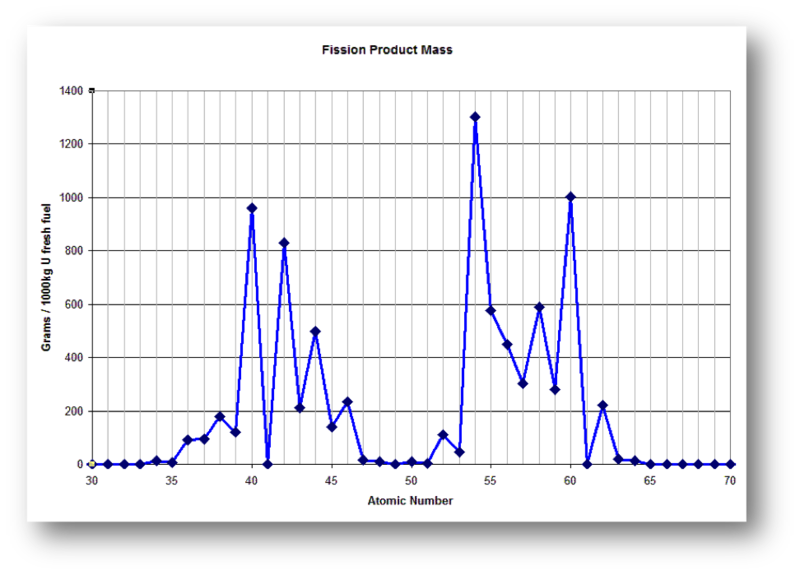 Typically one piece is larger and one piece is smaller, so the distribution of elements produced via fission results in two distinct peaks. These fission products will eventually build up in a reactor over time. They also have a propensity to absorb thermal neutrons, which will reduce reactivity and ultimately shut down the reactor. This is a disadvantage of reactors that operate with thermal neutrons. Nearly all reactors in operation today use fuel in a solid state (as opposed to a liquid or a gas). In such a reactor the fission products build up and remain in the reactor fuel pellets or fuel medium. Molten Salt Reactors use a different fuel form altogether. They use fuel as a liquid, not a solid. In an MSR fuel is dissolved in a salt. There are different salts available, but one of the most promising is Lithium-7 fluoride – Beryllium fluoride (FLiBe). This salt has some interesting characteristics. It is a solid up to about 350 C – A high temperature, but nearly ideal for reactors. It does not boil until about 1400 C (~2500 F). – affording a high margin of safety. It has these properties at atmospheric pressure. It does not need to be in a pressure vessel ! It does not need to be in a pressure vessel !!! Thus there is no stored energy to be released in an accident. It is a salt, an ionic bond material, which is impervious to radiation damage. It has a high heat capacity of 4.5J/g which is similar to water. It expands slightly upon heating. – resulting in a strong negative temperature coefficient. Uranium tetrafluoride is dissolved in this salt . This Flibe salt serves two functions. It carries the fuel, and it is the primary coolant. The use of the term “coolant” may be a little misleading. It carries heat energy out of the reactor to do useful work. The higher temperatures allow for greater thermal efficiencies, as well as enabling their use in many applications beyond just electricity production. Although the salt will remain a liquid up to 1400 C, the actual operating temperature will likely be below 750 C due to other considerations. The characteristics listed above significantly impact the reactor design. The strongly negative temperature coefficient means that if the reactor overheats (for any reason), the salt expands, which lowers reactivity resulting in less fission and less heat generation. This is a necessary safety feature and limits how hot the reactor will get. The fact that the fuel is in a liquid state means that a meltdown is impossible (by definition). The closest equivalent would be a “boil over” which requires temperatures that the reactor cannot reach without completely shutting down. A typical reactor would have, at its very lowest point, a simple freeze plug. If the temperature were to exceed the maximum acceptable temperature, the freeze plug would melt, and the molten salt would drain into drain tanks. These tanks would be configured for maximum passive cooling. The liquid fuel form and the higher acceptable temperatures make for a very high degree of passive cooling. Passive heat energy rejection can be well beyond the heat generated by decay heat (heat from the decay of fission products, that cannot be stopped like fission, but must be managed) and make a boil over virtually impossible. A liquid Fluoride Thorium Reactor (LFTR) is a molten salt breeder reactor. There are a number of design types, but perhaps the most interesting configuration is one that has two fluids. 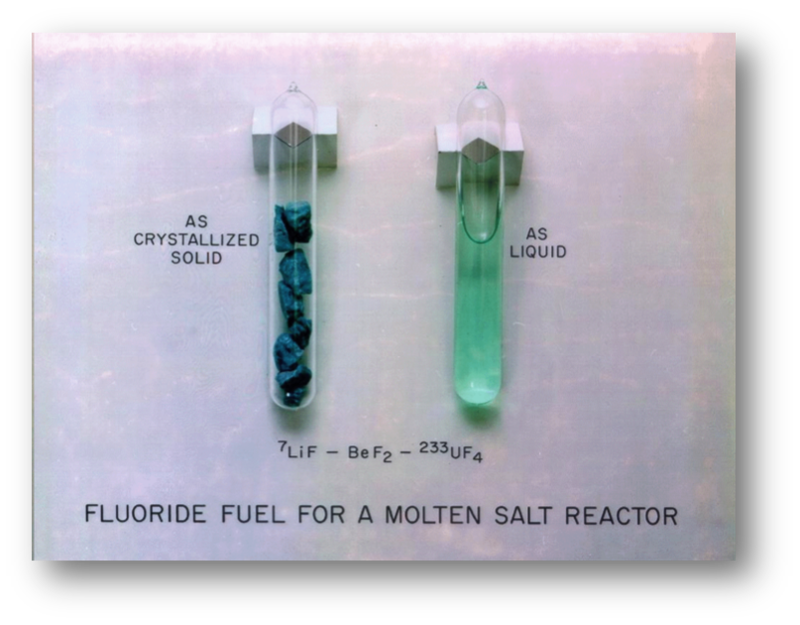 One fluid is FLiBe salt with Uranium tetrafluoride dissolved in it. This is where fission takes place and is the reactor core. Another fluid surrounds the core and is referred to as a blanket. The blanket is FLiBe salt with Thorium tetrafluoride dissolved in it. Integral to the LFTR design are two chemical separators. One operates on the blanket salt. The blanket salt is continually processed to remove the Uranium-233 fuel produced. This is fuel, and it gets transferred into the core. The second chemical separator would operate on the core salt to remove the fission products produced. This allows the reactor to operate without fission products build up. Additionally, fuel (U-233) that absorbs a neutron but does not fission becomes U-234. U-234 can absorb a neutron and will become U-235. U-235 is fissile, so if U-235 absorbs a neutron it will likely fission. 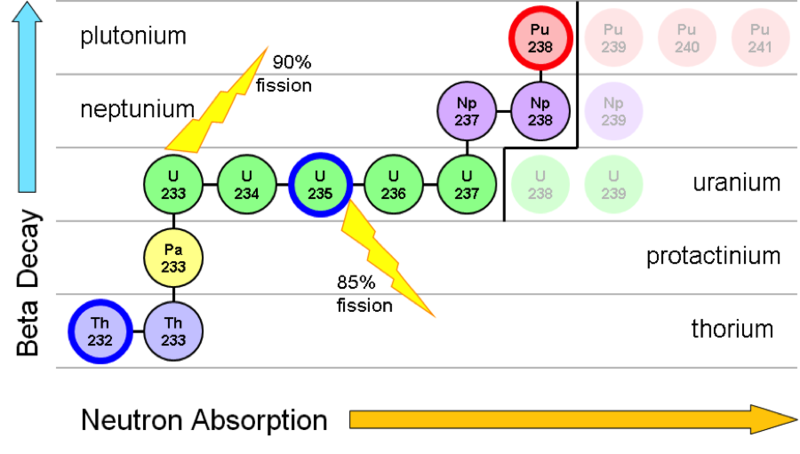 However, not all U-235 that absorbs a neutron will fission. This will become U-236. About 1.5% of the U-233 fuel will become U-236. U-236 can absorb a neutron and become U-237. U-237 will likely beta decay and become Neptunium-237 (Np-237). Np-237 can absorb a neutron and become Np-238. Np-238 will likely beta decay and become Plutonium-238 (Pu-238). WHAT TO DO WITH THE PLUTONIUM? Pu-238 is an ideal fuel for Radioisotope Thermoelectric Generators (RTGs). Under present circumstances, Pu-238 is difficult to come by, but a LFTR produces it as a by-product. Additionally, Uranium-237 can absorb a neutron and become U-238. This is on a path to product Pu-239 and above. Although very little Pu-239 is produced, a LFTR can keep these transuranic elements (elements with atomic number >92) in the core, and they will eventually fission (and thus destroyed). It is the presence of Pu-239 and the higher actinides in the spent fuel of today’s Light Water Reactors that necessitates the long duration (hundreds of thousands of years) of nuclear waste storage. With a LFTR, almost no higher actinides make it to the waste stream. With a waste stream made up almost entirely of fission products, the waste need only be sequestered from the environment for a few hundred years. This is a far less daunting task than keeping radioactive waste out of the environment for hundreds of thousands of years. It is the ability to process the core material and remove unwanted elements that enables a much cleaner burning reactor. This is a huge advantage of a molten salt reactor, and the processing story doesn’t end there. Once the fission products can be removed, the LFTR produces a stream of radioactive isotopes of various elements. Some of these have value in their own right. For example, Molybdenum-99 (Mo-99) is produced by about 5% of the fissions of U-233. Mo-99 is a radioisotope used in the production of technicium-99m (Tc-99m). Tc-99m is used in over 15 million medical diagnostic procedures annually in the United States alone. The reactors used to produce Molybdenum-99 are not in the US (Canada and the Netherlands produce the most Mo-99, and the others are also in Europe for the most part), are old. They are slated to be shuttered in 2016. Not long ago the reactors used to produce Mo-99 went off line, and the Tc-99m based diagnostic procedures all but ceased. This created quite a panic in the medical community. A LFTR can produce Mo-99 in abundance. The chemical separator that operates on the core salt also collects nuclear isotopes. It is a significant aspect of a LFTR design. Because 100 percent of Thorium in the earth’s crust is Th-232, all natural Thorium can be used as fuel. The earth’s crust has nearly 4 times as much Thorium as Uranium. In fact, small amounts of Thorium are present in all rocks, soil, water, plants and animals. Soil contains an average of about 6 parts of Thorium per million parts of soil. That may not sound like much, but recall that the energy density of Thorium is over 1 million times greater than that of any fossil fuel. That means there is roughly the energy of four barrels of oil (in the form of Thorium) in a cubic foot of dirt, everywhere! Including the dirt in your backyard! So, if the population of the earth were to consume energy at 10 times our present rate, we could power the world for one year on 10 billion tons of dirt. The world presently consumes over half this quantity of coal alone in a single year. Since we are talking about common dirt, we could supply the world with energy (at 10 times the world’s present rate of consumption) for millions of years. Additionally, Thorium exists in a number of locations around the world, including the United States, at much greater concentrations than 6 parts per million. In fact, it is commonly found with “rare earth” elements and is the reason rare earth mining doesn’t occur in the United States to any great extent. But that’s a regulatory topic for another discussion. Present day nuclear power uses water as both a neutron moderator, (slows down the neutrons from the very high speed they come with out of the nuclear fission reaction) and a coolant (heat transfer fluid to run turbines and create electricity). For water to function efficiently as a medium to carry heat to a turbine, it needs to be much hotter than the 1000 C at which water normally boils. This is accomplished by running the reactor under pressure. Up to 140 atmospheres of pressure. This means the reactor is inside a pressure vessel at pressures up to 2,000 PSI. If for some reason pressure is lost (e.g. a pipe break), the water would flash to steam and cooling of the reactor core would practically cease. Fission would stop, but the decay heat (heat generated from residual radioactivity from the fission products) would continue. If there is no water on the core to cool it, the core will soon melt and release the fission products. This is what happened at Fukushima. Guarding against this event drives the design of the reactor and drives up the cost enormously. There must be a thick steel walled pressure vessel and a thick reinforced concrete containment building with about 1000 times the internal volume of the reactor pressure vessel (to contain the steam that would be released in the event of a pipe or vessel breech). There is also a variety of pumps and backup systems to get cooling water on the core if things go wrong. All built to “reactor grade” specifications (and associated regulatory compliance testing and paper trials). Contrast this to a LFTR. LFTRs can operate at very high temperatures at atmospheric pressure. This eliminates the need for a pressure vessel. LFTRs have no water that can flash to steam. This eliminates the need for the large reinforced concrete containment building. If a LFTR needs to be shut down, you drain the liquid core into a series of drain tanks under ground that are configured to dissipate the decay heat passively. There is no need for high pressure backup pumping systems to keep the molten core cool. This significantly simplifies the reactor design and lowers the capital cost of the reactor. Today’s nuclear energy comes from pellets of Uranium oxide, enriched to about 3.5% U-235, cladded in Zirconium and fabricated to exacting tolerances. Compare this to a LFTR, where almost no fuel fabrication is required. Fuel costs for a LFTR are essentially the costs of extracting and purifying the Thorium. With a Liquid Fluoride Thorium Reactor, we can essentially consume “dirt” as fuel. We can produce far less radioactive waste. The waste that is generated is far easier to manage. 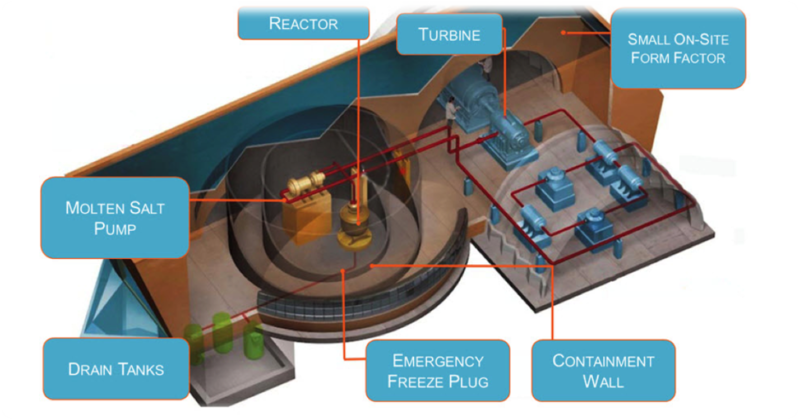 Capital costs for a LFTR reactor would be significantly lower, and the cost of the energy produced would be lower than with a traditional Light Water Reactor. Additionally, LFTR operation can generate income streams other than the sale of energy, due to the sale of valuable fission products. The vast energy produced by LFTRs will increase the standard of living for everyone on planet Earth. 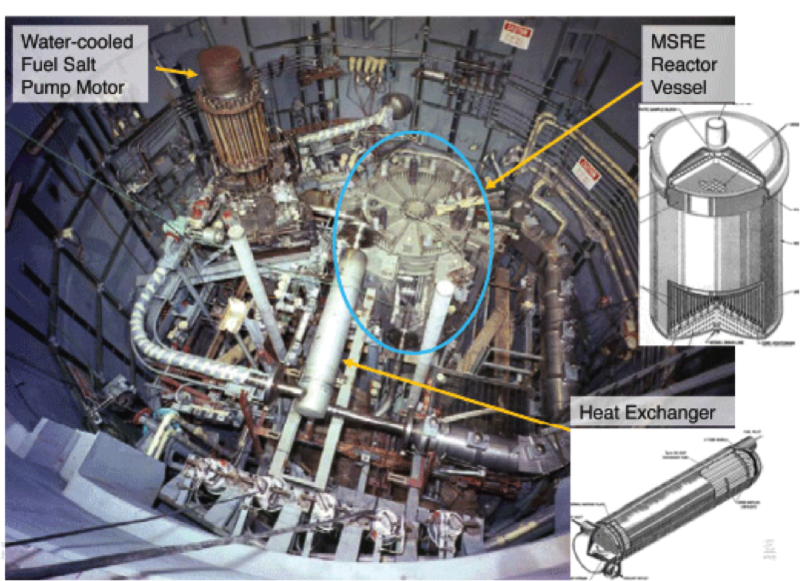 Molten Salt Reactors were validated in the late 1960s at Oak Ridge National Labs under the direction of Alvin Weinberg, The Molten Salt Reactor Experiment (MSRE) ran for 4 years, from 1965 thru 1969. (en.wikipedia.org/wiki/Molten-Salt_Reactor_Experiment). This reactor generated 7.5 Megawatts of heat, allowing the scientists to determine the design parameters and work through system issues to arrive at a design that allows for the burning of nuclear fuel in molten salts. The MSRE worked out nearly all key issues needed to build a LFTR. Conventional Nuclear Power suffers from two key issues: existence and long-term (hundreds of thousands of years) sequestration of spent nuclear fuel or nuclear waste, and costs of plant construction. MSRS will significantly mitigate both of these issues.